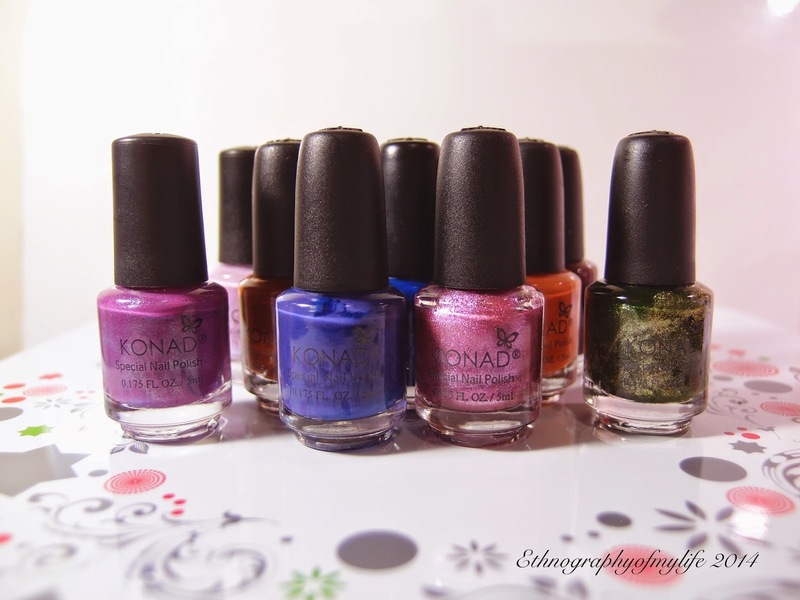 Look my new Konad little army! 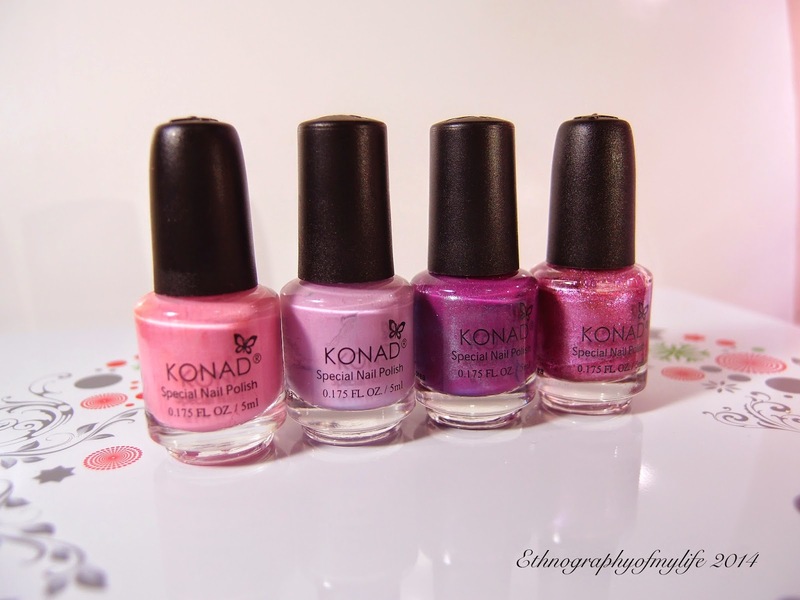 My BF placed an order of Konad special polishes for me! The bag comes with 11 Konad special polishes!!! They are the prefect 5ml size for me to test some color matches. I was having a very hard time to pick the colors, because Taiwanese sellers have no English labels for the colors as well as lack of information which will be better. The ideal is to get all the colors... but that will kill my wallet. This eleven is my final picks then. 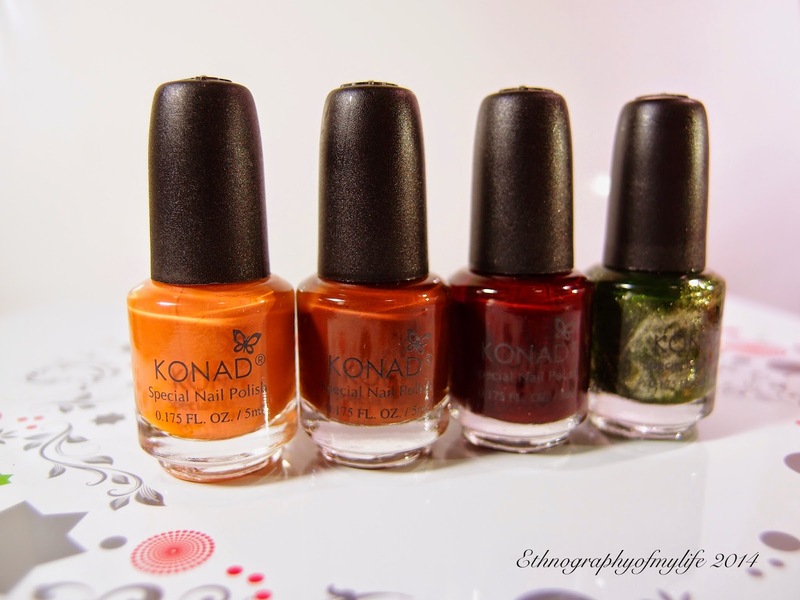 If you want to know the difference of Konad special polishes, you can check out this post here. Vivid Pink is made by different formula. It's less saturated and more sparkly than the rest. It won't work well on the very detailed images, but will look fantastic on a dark base. Moss Green has the same finish as Vivid Pink. The rest are very straightforward, and my beloved creme finishes. I suddenly noticed that those colors. I should have use the orange for Halloween, boo! I know that Black is a staple and I should get a big bottle. I actually have Black already back in Canada and I sadly didn't bring it with me to Taiwan. In the meanwhile, this small bottle will do then. I really love Royal Purple, some websites listed as Royal Blue is a very unique color, I am very excited to try it. Those are my travel companions at hands, and now they have a whole bunch new little friends then! There you have it all, for now! I can't wait to try them all with my new Moyou plates. So many possibilities with those new additions, can't wait!